I'm Skating an Inline Marathon! I am officially skating an inline marathon! I'm signed up for the Northshore Inline Marathon in Duluth, MN on September 14, 2019. Click here for actual proof of enrollment! My soon-to-be marathon ready inline skates! End of April: Signed up for an inline marathon, which I planned to complete on roller skates. Asserted that I could TOTALLY do a half marathon without any training if I had to and it would be fine. Announced my intention to complete a marathon to friends and family via social media. April-July: Went to the gym 8 times per month (mostly because my company only pays for my gym membership if I visit 8 times per month.) Skated at a roller rink once per week most weeks and skated 3 miles on a local trail occasionally. Did a 3 mile walk with a friend once most weeks. 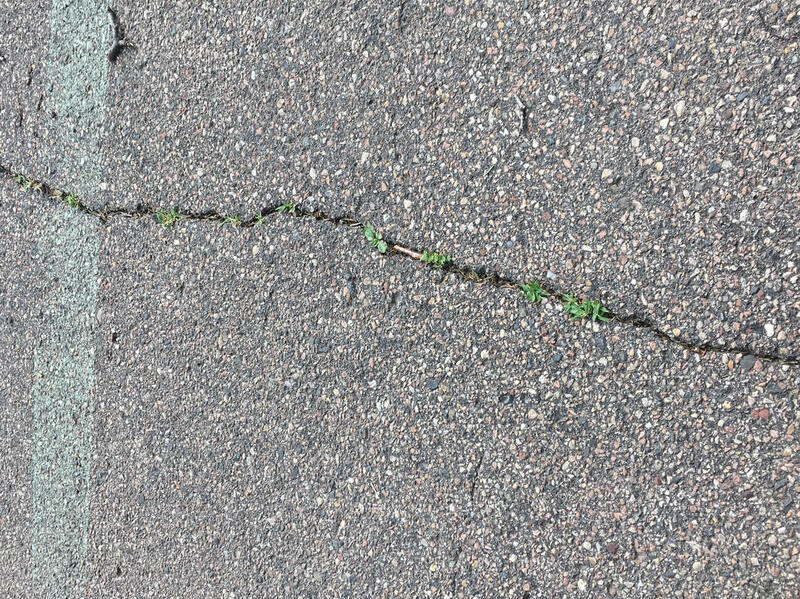 14 days to the event: Skated 2 miles on a rough asphalt trail and realized that my outdoor roller skates had a fair amount of resistance. Resistance=more work to get not very far=I may not be able to finish 13.1 miles. Initial panic ensued. 13 days to the event: Decided I needed inline skates. Researched and purchased new skates. 12 days to the event: Attempted to skate a 3-mile lake lap in my new inline skates. Skated a grand total of 9 minutes before I realized that there was JUST NO WAY this was going to work. 11 days to the event: Decided to skate in my roller skates as initially planned. Attempt unsuccessfully to do months of training in a few days. 4 days to the event: Picked up my number. Drove the event route. Tried to convince myself I could to finish with way too little preparation. Didn’t quite believe my own pep talk. 3 days before the event: Went on a last-minute business trip, and came home with a head cold. 1 day before the event: After making extensive pro and con lists, I decided to drop out. 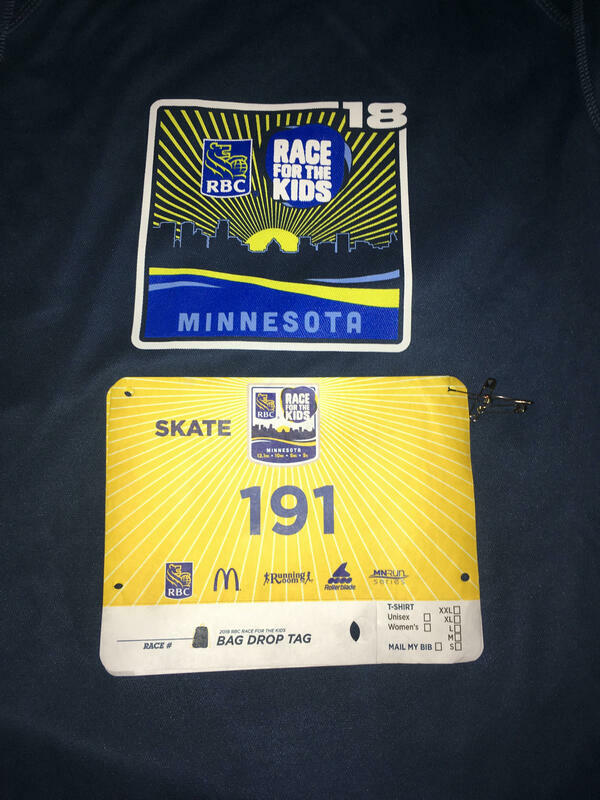 T-shirt and race bib for my ill fated (aka "not attended) first shot at an inline half marathon. So when did the wheels come off this whole thing? I can point back to the very beginning where I told myself “I could TOTALLY do a half marathon without any training” and promptly did pretty close to NO actual training. My non-existent training plan, and lack of good old fashioned “I’ll white knuckle my way through it” willpower contributed to my failure. Also--I seemed to think that announcing my intention to do the half marathon was enough to get me to actually, well, do it. This past fall, I signed up for the Northshore Inline Marathon. Even before I enrolled, I started planning for my success. Here’s my basic plan. 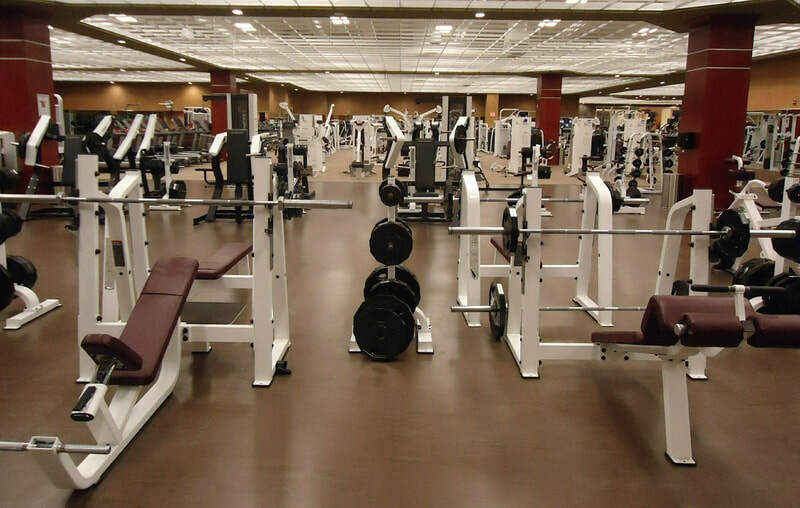 ​Goals: Build a base level of fitness. Build the exercise habit and get in the habit of pushing myself to improve. Increase number of steps I took on a daily basis using stretch goals. Increase flexibility and strength by incorporating yoga, weight lifting, and foam rolling. Get my body used to my inline skates. This beautiful foam roller is the core reason I am able to walk after all of the exercise challenges. Transition from walking to running and challenging myself to go faster and longer. Incorporate inline skating and biking as cross-training. 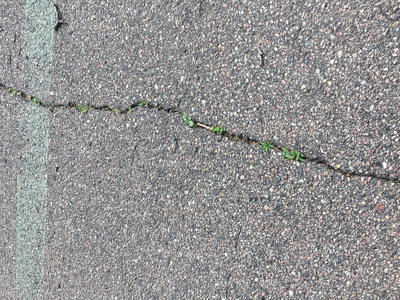 Goals: Skate longer distances outside on uneven terrain. Strategically, build up mileage I’m able to skate on outdoor trails. Skate indoors and run if weather prohibits outdoor skating. Improve skating technique to increase skating efficiency. ​I'll elaborate on specific tasks and milestones in my inline marathon training plan in future blog articles. My inline skate and fancy kneepads! When training for an event, what kind of strategy have you used to be successful? Include your thoughts in the comments. Whole Food Plant Based (WFPB) Diet: What Do You Eat? Why a Whole Foods Plant Based (WFPB) Diet? I started eating a predominantly Whole Foods Plants Based (WFPB) Diet a few months ago. I did this for health reasons motivated by my ongoing quest to improve my health, and after reading the book How Not to Die. In short, a diet that minimizes (or eliminates) animal based foods tends to help greatly reduce the risk of multiple health conditions including heart disease, multiple types of cancer, infections, depression, and more. As I look at people in my family who have struggled with health issues, I'm taking proactive steps to help maintain and improve my overall health and well-being. Is Whole Foods Plant Based (WFPB) the same as Vegan? My best answer to this question is "it depends on who you ask." Some will define being a vegan as including political views as well as dietary habits. Many vegans also champion causes against animal cruelty and beliefs impact well beyond diet to include choices in personal care products and clothing. In addition, while vegan's don't consume animal products, they may eat process animal product substitutes like Tofurky, Morningstar, almond milk, or cheese made from cashews. People following a WFPB diet stay away from processed foods, and some may even still eat some animal based products, but in moderation. Some WFPB diet followers also avoid sugar and oil for health reasons. In short, WFPB and vegan aren't necessarily the same, but there is a lot of shared ground on the dietary front. Tofu is for sure vegan, but not as compliant for a Whole Foods Plant Based (WFPB) diet. When it comes to dietary choices, much like political parties, some people are strong enforcers of being a purist. Vegans must hold the corresponding societal views. WFPB followers must eschew oil and sugar. Some are strong advocates of eliminating dairy, meat, and eggs altogether. There are also varying degrees of acceptance on protein powders. Most are adamant on no meet whatsoever. While I appreciate the keepers of the definition, I don't neatly fall into a category. I eat predominantly vegetarian but I don't scour ingredients lists for any trace of animal products. I eat avocados, which sometimes get labeled as "not vegan" due to bee involvement in production. I have whole cow's milk in my lattes because, honestly, soy milk and almond milk both taste yucky to me. I have accidentally eaten a bacon bit or two when picking through a salad ordered for a group of people at work. I have had a battered fried cheese curd or two because I enjoy them. I also know that I can't eat much meat or cheese because my body has next to no tolerance for those things. I also have not attempted to remove all oil or sugar from my diet because I've made so very many dietary changes so far that I want to give myself a break from perfection. My label? I tend to say I'm "just this side of vegan" and call it a day. And yes, some groups that I follow online chastise one another for not buying organic, or completely eliminating oil, or eating meat occasionally. I'm not a purist because I don't think that's helpful for me. In short, I try to eat better for my own health, not to completely fulfill someone else's ideal version of whatever label is in vogue now. 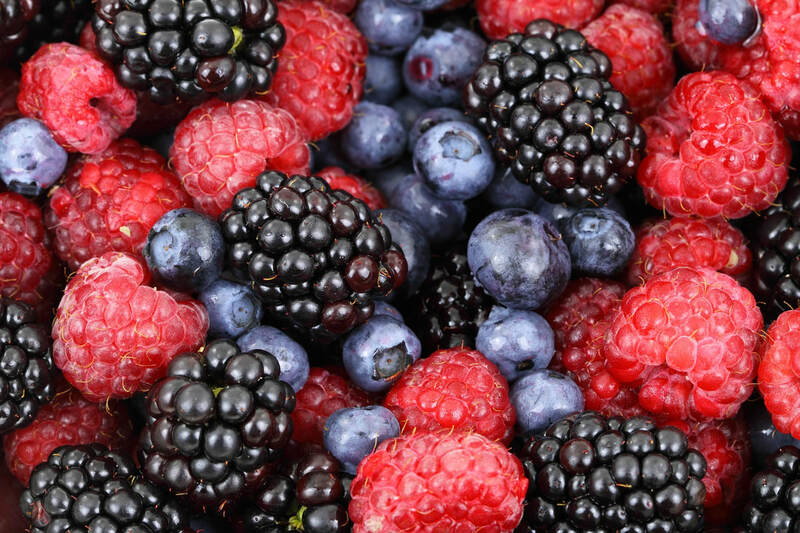 I am a big fan of berries, either raw or in smoothies. Smoothies: I typically make a smoothie once or twice a day. These include frozen fruit (cherries, a mix of raspberries/blueberries/blackberries, strawberries, or a mix of mangoes/pineapples/peaches/strawberries), vegan protein powder (vanilla), a banana, ginger or cinnamon, and rice milk. Beans: Chickpeas are my go-to bean. I put them on salads, eat them air fried, and eat hummus as a dip. I also like kidney beans and cannelloni beans. 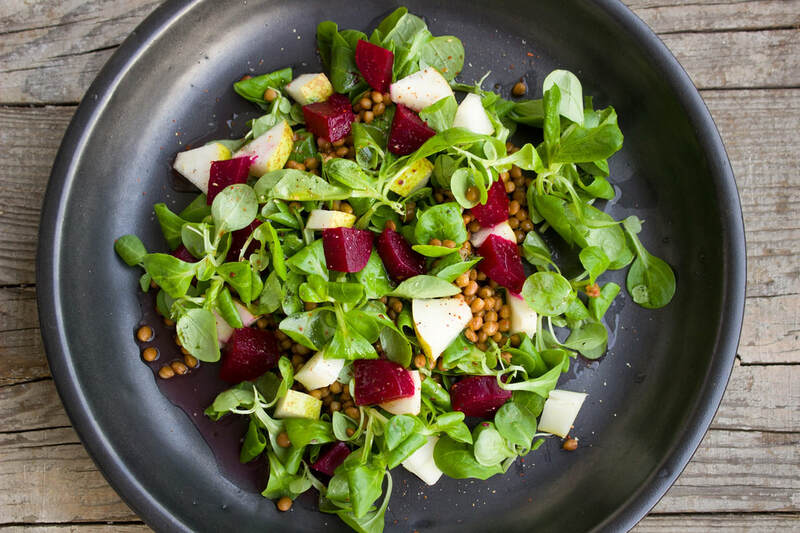 Salads: I start with dark leafy greens with baby arugula being my go-to. (Baby arugula tends to last longer than other leafy greens). I then add sunflower seeds, beans, mushrooms, and poppy seed dressing. Rice: Brown ride and wild rice are staples of my diet. I usually add beans, peas, or broccoli. Nuts: I eat a lot of sunflower seeds. I also eat roasted mixed nuts, Brazil nuts, and walnuts. I eat them as snacks or as part of other dishes. Oatmeal: Oatmeal is handy since instant oatmeal travels well. I often add dried goji berries for flavor and nutrition. Popcorn: I typically eat popcorn instead of chips as a snack. Raw vegetables: I eat raw vegetables including carrots, jicama, celery, snap peas, cauliflower, and broccoli. I love a good veggie tray. Raw fruit: I eat apples, avocados, and clementines. Cooked vegetables: I enjoy broccoli, sweet potatoes, green beans, and peas. My absolute favorite cooked vegetables? Roasted brussel sprouts with garlic. Guilty pleasures: ​Potato chips, french fries, white chocolate, dark chocolate. How do you define how you eat? 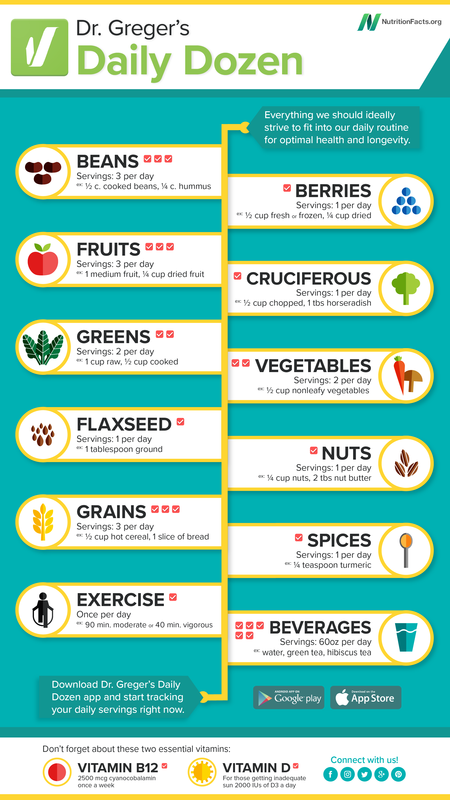 What are your healthy favorites? Include your thoughts in the comments. Nutritionfacts.org: website to keep up on research-based health information. There are several days each year where people typically look back and assess their lives. This could be the anniversary of a death, a holiday full or memories, or your birthday. For me, the day I look back at my life is Groundhog’s Day. A groundhog--shaking his angry little fist at the world. Early in 2006, my life was at a crossroads. My then-husband and I were in the process of getting divorced, and I was figuring out how to transition from a house to two houses and what co-parenting my 2-year old daughter would be like. The one stable thing I had was my job. I was happy to have one thing that I could count on not changing. …and then February 2 happened. That morning, I went to work. I took a few minutes between meeting to create a spreadsheet to figure out if I could afford to buy a condo I’d looked at the night before on my own. As I saved, I got a tap on the shoulder that I had an impromptu meeting. I grabbed a pen and a legal pad and walked into a conference room full of executives who informed me that position was eliminated due to restructuring because of the company being acquired. I was in shock. I returned to my desk, deleted the spreadsheet of my financial plans (which in just a few minutes had become irrelevant), told my coworker Brad “I’m gone,” and found myself sitting in my car with a box containing all of my formerly workly possessions. That weekend, I was on a road trip to visit some of my high school friends for a fun weekend of reminiscing and going to the Snowflake Ski Jump. On my way there, a local cop pulled me over for speeding. As I sat there, I glanced at the notification I’d just received from unemployment sitting in my passenger seat—the one that said I’d receive less money than the previous time I’d been laid off—meaning I wouldn’t be bringing enough money in to cover my half of the mortgage. As the officer came to my window, I could feel the tears well up. I could not get a ticket, too. I would cry (as I often heard people threaten to do), but this was no empty threat that would come to bear only through theatrics. I was legit going to fall apart if this happened. This moment—sitting in the car with indications of my life failures greatest hits smacking me in the face, was a low point in my life—second only to my dad’s unexpected death. Fortunately, I think because of my street cred, which included being a native of a town nearby, I drove away ticket free. One thing had gone okay. Then I got to see friends, connect with new people, and spend more time with my daughter. I also had the time and space to figure out what to do with myself now. Mine and my daughter's roller derby skates. One of the things for which I am grateful. It was an ugly, ugly few months. I applied for countless jobs. I put our house up for sale. My daughter’s dad (new language from Mom’s House, Dad’s House) and I decided to move in tandem to Minneapolis, Minnesota from Madison, Wisconsin. I looked for jobs, made business connections, and stayed with friends on the way to and from my regular trips to Minneapolis. I didn’t sleep well for months. A tree fell down in my front yard the day of my open house, so I figure out how to have a giant tree removed while driving on I-90 from a job interview. That May, I found a job, a pre-school for my daughter, a new place to live, and reconnected with one of my best friends from high school. Later, her dad found a job and moved, too, with his new girlfriend (who was a lovely person who was good to my daughter). Then, I totaled my car, dated and broke up with a couple of people, and got Shingles three times in a row. Some days, after work, I would lie on my floor and look at the ceiling in my apartment, my low-cost therapy as I adjusted to all of the life changes. I adjusted to my new normal after going through every major life change (save a death in the family) I could think to experience. I got laid off again and got another good job, then got laid off again and got an even better job. My husband and I celebrate our 10th anniversary this year, my daughter is doing well, and my best friend and I get together most weeks to catch up. Life is pretty damn good. 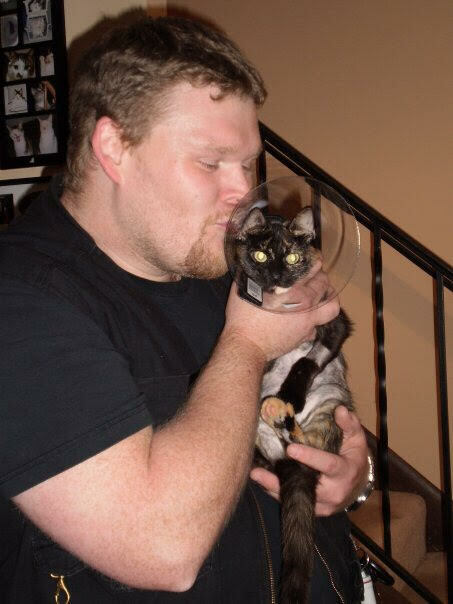 My now-husband with our kitty, Meathook, when she was sporting the cone of shame. Sometimes, I see people who don’t seem happy with what they have. The strange upside of having gone through rough times is that it gives you a frame of reference. It reminds me to be grateful for the house that I love, my husband sitting in the living room with our two cats in his lap, my healthy, happy teenage daughter (including her brown, purple and blond hair), and my challenging job that I absolutely love. ’m grateful for being active, able-bodied, and having a strong sense of well-being. I am grateful for heat in the winter, air conditioning in the summer, and automatic garage door openers. I treasure mother/daughter movie night, trips to the skating rink, and even playing chauffeur on the girl’s friend outings. I value my roller derby skates, my outside roller skates, and my inline skates. I appreciate my cats, Zippy and Meathook, and the combination of disdain and affection they have for me. I am genuinely grateful for it all. Groundhogs Day is my annual reminder to remember all these things. Zippy looking particularly disdainful towards me as she angrily sits in my lap because my husband's lap was not available. That's cat love. ​What reminds you to take time to be grateful? Include your thoughts in the comments. In roller derby, pads are not for if you fall, but for WHEN you fall. Keep this in mind as you pick out your first roller derby gear. Having the right safety equipment is a prerequisite for even entering practice. Your gear will be checked to make sure you're wearing all the pieces and that it's all on correctly. Missing equipment means that you don't get to skate. ​Being a sport that not just everyone knows about, it takes a little bit of research to figure out what to buy, how to buy it, and where to buy each item. Here are a few tips to get you started. Don't cheap out. You get one body, and you want to keep important parts like your knees and head functional for a good long time. Spend a little bit more to protect your important parts. 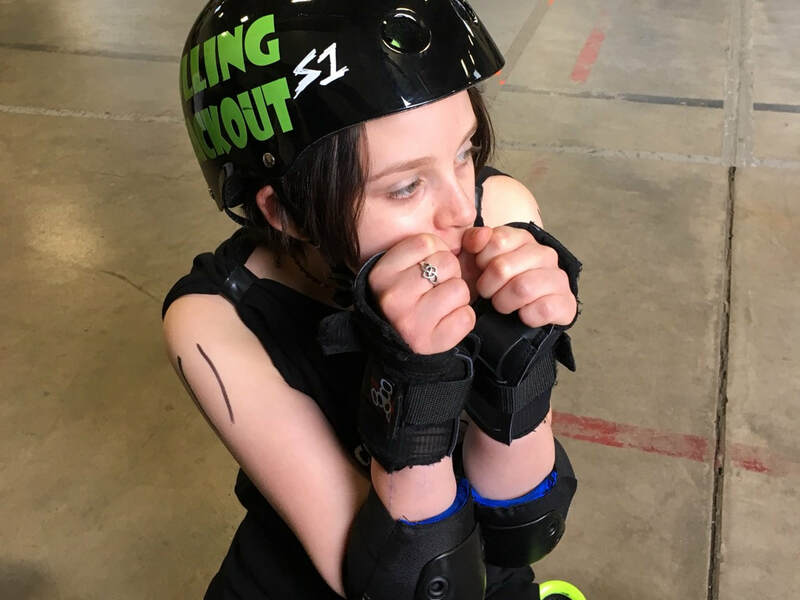 For example, JBM offers a very low cost pack of knee, wrist and elbow pads--and they aren't going to give you the kind of protection you need for derby. Don't start with super-expensive gear. When you start, buy good, quality gear, but don't feel like you need to have the very best of everything. 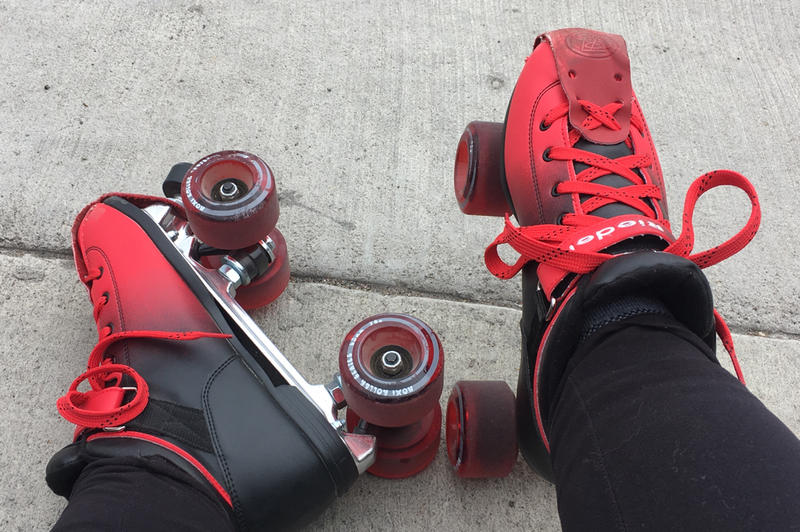 Most skaters upgrade their gear over time if they decide to stick with roller derby. Check out "Fresh Meat" sets. Several online store give you a package price on gear, even offering multiple price points and levels of quality. This is an easy way to get the things you need without having to make many, many, many different buying decisions. Consider borrowing. Many roller derby skaters have extra skates and pads. Borrow first when you can, then buy when you're sure you'll stick with it. Consider buying used. I'll include places where skates sell their gear--even full sets of gear. Real live roller derby skaters decked out in their required, yet colorful, safety gear. You're looking for roller derby skates, not inline skates or artistic roller skates. Roller derby skates usually have a lower boot than the skates roller skating rinks have for rent. Derby skates are typically sized in men's sizes, and for women, buying 1 size smaller is recommended. Here are few popular skates for fresh meat (roller derby newcomers) that run about $100-$175 : Reidell Dart​, SureGrip GT-50 and ​Reidell R3. My first roller derby skates were Reidell Dart Ombres. I later changed to softer wheels, and now these are my outdoor roller skates. Since concussions are prevalent in roller derby, getting a quality helmet is important. Helmets used for roller derby are not the same as bicycle helmets. Typically a skateboard helmet or hockey helmet works. Measure your head, and use those measurements to make sure you purchase the right sized helmet. A helmet will probably be at least $30. Triple 8, Pro-Tec and S-1 are frequently purchased brands. Personally, I got the Triple 8 Helmet with Sweatsaver Lining. 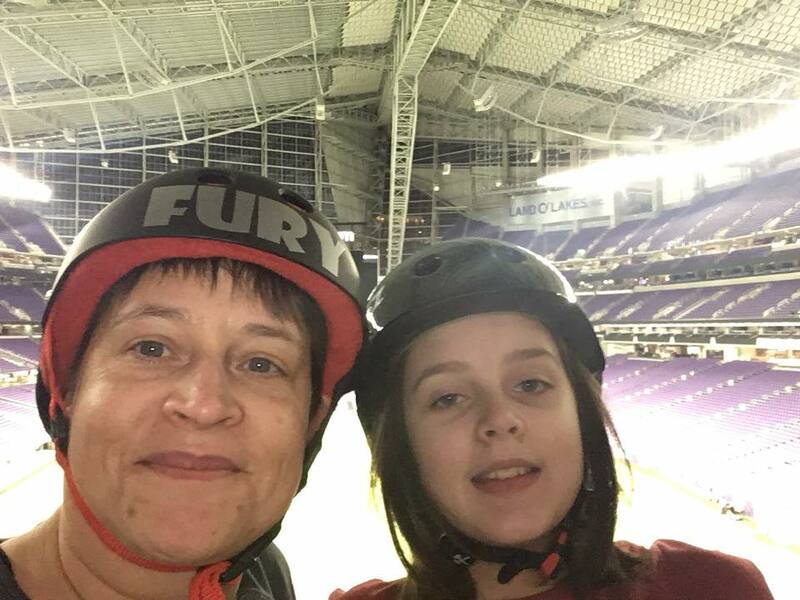 Me in my Triple 8 Helmet, and my daughter in her S-1 helmet skating at US Bank Stadium. You can pick up a sports mouth guard at a drug store or big box department store for under $10. Many roller derby skaters grab a mouth guard by SISU. They are lighter weight and you can drink and speak more effectively with one in. These may run around $30 and come in a variety of fun colors. You need a set of elbow pads with hard plastic on the elbows. Popular brands are Triple 8, 187 and Pro-Tec. Make sure they fit snugly on your elbows. When talking with derby folk about gear, many people have strong preference on nearly everything--except elbow pads. I went with these Triple 8 Elbow Pads. You need a set of wrist guards that have braces on the fronts. (If you see roller derby skaters clapping, they are usually hitting their wrist guards together.) Ideally, wrist guards should have a brace on both sides for additional stability and protection. I own two sets of Triple 8 wrist guards--one pair of slide ons and one pair that wrap around. It's pretty much personal preference. 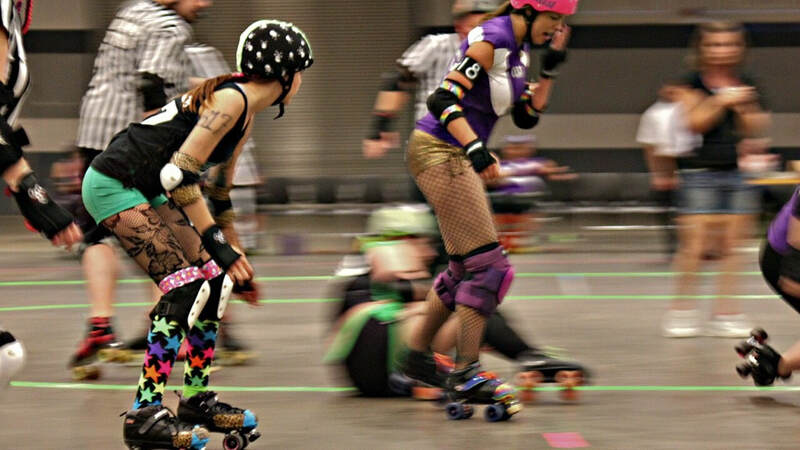 In roller derby, falling is inevitable, and I almost always fall on my knees. There are also several skills that require you to land on or tap your knee pads. Consequently, knee pads are a good place to buy better gear right away. ​Personally, I started with low end Triple 8 knee pads , and I quickly upgraded. I went with 187 Killer Pro Knee Pads. While I ended up spending about twice as much on the nicer knee pads, not damaging my knees is worth way more than that. Some people don't like how far the 187s stick out, so try out different brands or talk with other skaters to see what they like. Pro-Tec, Smith Scabs and Deadbolts are just a few other brands to check out. See the Learn More section for a link to an article including knee pad reviews. Ideally, you'd get a chance to try on gear before you buy it. Be sure to see if there is a roller derby shop in your area. In the Twin Cities, check out Wheels on Wheels. (The owners are involved in roller derby and work by appointment.) General sports stores, or skateboard shops, may have some equipment, but not necessarily the best derby specific gear. 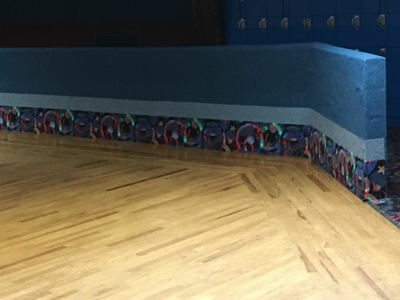 For beginning derby skates, you may want to check out the pro shop at your local roller skating rink. The selection is typically not huge, but you may have a chance to try on skates. Be sure to check with other skaters. They may have gear that they want to get rid of that can get you started. What are your roller derby gear preferences? Include your thoughts in the comments. About a year ago, I began driving to and from work on a daily basis. Consequently, I have become an avid audiobook listener. I enjoy reading non-fiction, and I focus on topics including business, management, social science, and health. I've read a lot of books focused on personal improvement. While the information is always beneficial, here are three books that stood above the rest. 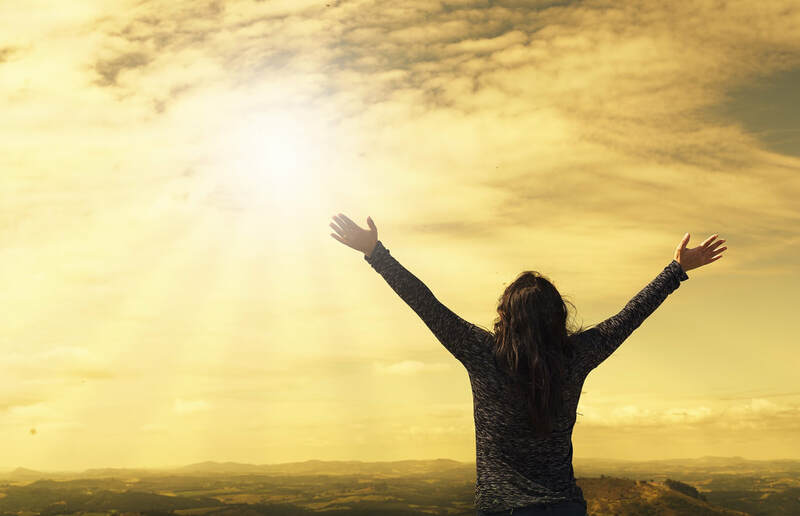 They include convincing arguments for making positive life changes, straight talk about personal accountability, and specific steps to take to take needed action. In fact, each of these books was so helpful that I initially listened to them, then bought them in a hard copy to have access to the exercises and as a reference moving forward. Here they are in the order that helped me to take best advantage of the information. I was looking for a book on being a better conversationalist. After a couple of false starts with other books that focused on rehearsing conversations and strategies for coping with severe social anxiety, I stumbled across this book. This book is about being more authentic as a person, which can increase personal confidence and make it easier to move freely about the world--including having conversations with people you don't know very well. At it's core, it is about our misconceptions about being nice, and how we "nice" ourselves into insecurity, resentment, and unhappiness. Dr. Aziz's personal stories resonated with me, and encouraged me to reexamine my attitudes and behaviors. The book includes exercises on everything from evaluating your personal "rules" for interacting with others to thinking through alternative ways to handle common situations. After going through these exercises, I am better at prioritizing what matters to me and living more authentically. As an extra added bonus, having a better sense of myself is helping me commit to the life changes I want to make. By giving myself permission to say no to things that don't appeal to me, and feeling more comfortable really committing to what I care about most, I'm making progress towards healthy eating and fitness. I was looking for a book about nutrition. While I knew the basics, I wanted to eat better, and I thought having more information on nutrition would help. I also thought it had a high probability of being painfully boring. I got nutritional information formatted in a way that I cared about it and decided to change my whole diet. 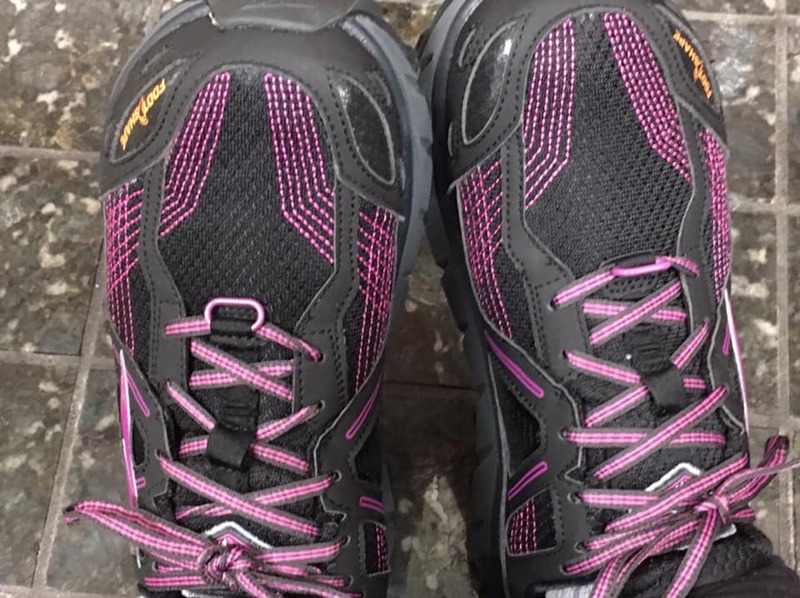 Given family history of obesity, pain management, and limited mobility, I wanted to take positive steps to position myself for a long, healthy life where I could skip having to take multiple medications, increase my overall level of fitness, and bypass health issues. This book guides the reader through health conditions and studies showing how healthier eating can minimize chances of getting the disease, or even provide treatment. Using scientific studies, and even acknowledging the shortcomings of some of them, this book lays out the "why" for the way of eating it advocates. The "why" is positioned not as fear mongering or shaming the reader into making positive life changes, but on the benefits of making eating changes that are completely within your control. The author, Dr Greger, is an advocate for a Whole Foods Plant Based (WFPB) diet, which emphasizes leafy greens and lots of fruits and vegetables. He also mentions that even if people don't become strict in their adherence to this diet, including more fruits and vegetables will have positive results. I would have never seen myself completely change my eating, but this book gave tangible, specific reasons to upgrade my diet for the better and never look back. I got more than a dry book on nutrition. Instead, I got the motivation and key strategies I needed to make positive, healthy lifestyle changes. As an extra bonus, the Daily Dozen (also available as an app) is a helpful tool to make sure I'm planning my diet around these core requirements. I will be completing an inline marathon later on this year, and I am making plans for my workouts leading up to the event. I also know that the last time I signed up for an inline half marathon, I managed to not make a training plan and ended up not even doing the event. I went in looking for motivation (and not even really knowing what I expected that to be). I was also not entirely convinced that I could get motivation from a book, but I was willing to give it a shot. This book is the stern talking to I needed to commit to a goal, take steps to motivate me to achieve it, and the "just do it" mentality to take action towards that goal. The focus is not just on thinking positive thoughts, but on doing the work to make success happen. Like with many books focused on personal improvement, there aren't a lot of new and unusual ideas. It does, however, bring together useful ideas and package them together to motivate action. It includes useful tools and exercises to get from "I should maybe sort of kind of do a thing" to "I'm going to the gym right now, and I'll continue to fine-tune my plan as I go." There are a few helpful exercises to help empower people to get out of their own way. So often, people sort of, kind of commit to a goal, then find every reason not to follow through. Personally, I think of all the excuses I can come up with for not going to the gym. Using the techniques included in the book, helped me to eliminate many of those lame excuses and motivate myself to go even if I don't totally feel like it on a given day. What books have influenced you to make positive life changes? Share your thoughts in the comments. Feeling Behind? This Can Help. I work at a fast-paced software company that is growing like crazy. That means that no matter how much I accomplish, there are always things left undone, and I feel like I should be able to figure out how to do more. In a meeting with my manager, where I shared this frustration, she told me that needed to remind myself of what I DID get done. She challenged me to take time each week to list out my successes. I've been doing that for about a month now, and it'a amazing what a difference it makes. Instead of focusing on the negatives, taking a moment to appreciate, and be grateful, for all the things I've accomplished really helped. That's right. I get ALL the thumbs up for my list of successes! While completing this exercise for my job, I also included a few successes from life in my list. I quickly realized that, as at work, I get way more life things done than I realize. I decided to go bigger with my list. At this time of year--when we so often focus on all of the things we're going to totally change in our lives--I decided to take stock of what all I accomplished this year first. Here are 50 things I did this year. Attended new high school freshman orientation with my daughter and lived to tell the tale. Booked my first Air BNB. Braced for an emergency airplane landing and walked away unscathed. Celebrated my 9th wedding anniversary with my lovely husband. Checked out two new grocery stores. Completed the 60-day fitness challenge at my gym. Created a joint email address for my household. De-crapped our entire downstairs by going through all drawers, cabinets and closets. Donated 23 bags of unneeded stuff to charity. Drove to work for the first time in 13 years. Endured the longest battle with the flu I’ve ever had and survived. Enjoyed seeing the Minneapolis skyline at night at Windows on Minnesota. 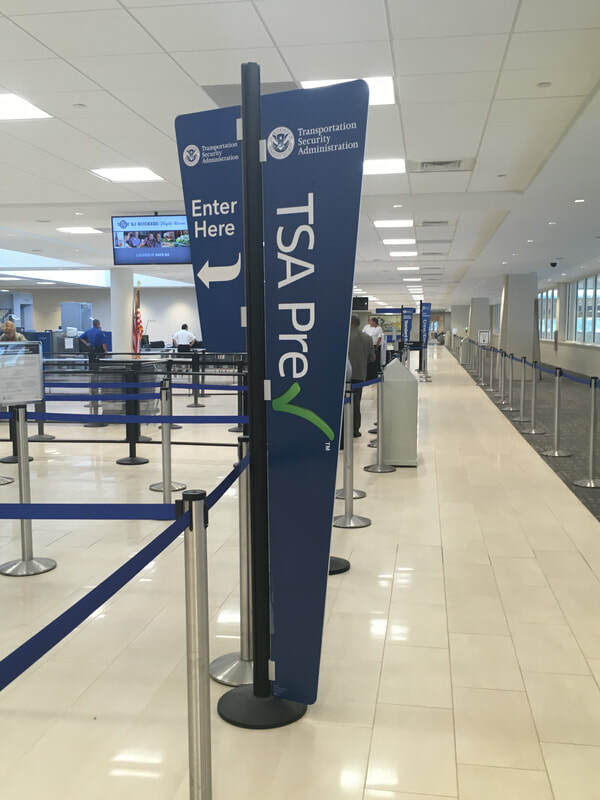 Enrolled in TSA Pre Check (which is the best $85 I have ever spent). Experienced a Cameron Carpenter performance. 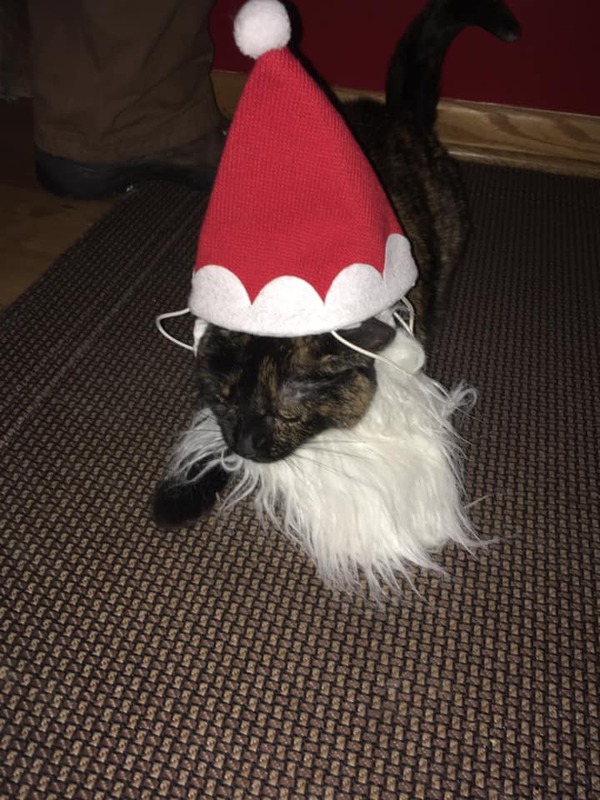 Finally snapped a picture of my cat, Meathook, in her Santa hat. Finished my first trail skate on inline skates. Found my daughter an orthodontist. Gave up meat and switched to a Whole Foods Plan Based (WFPB) diet. Got together with my best friend on a (nearly) weekly basis. 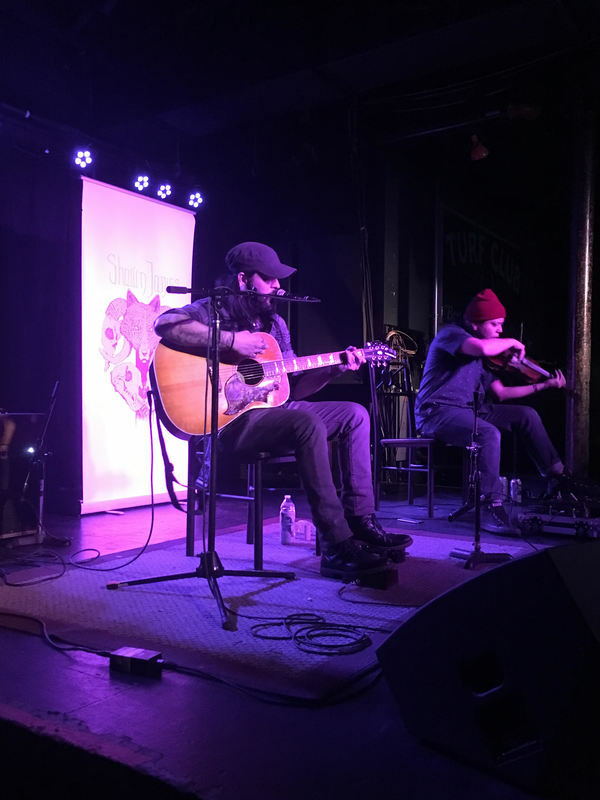 Heard Shawn James perform live at The Turf Club. Helped my daughter celebrate her golden birthday. Hired four, full time people to work on my team. Inline skated at US Bank Stadium for the first time. 27. Made my first smoothie in my very own smoothie maker. 28. Painted the living room walls red and gray (again, mostly my lovely husband). 29. Planned an upcoming vacation to New Orleans. 31. Rode the train from Duluth, MN to Two Harbors, MN. 32. Rolled over my old retirement account. 33. Roller skated at US Bank Stadium for the first time. 34. Saved money for retirement in a 401(k) and Roth 401(k). 35. Saw "Singing in the Rain" at the Heights Theater. 36. Shared my employment success story with the White Box Club. 37, Shopped for and bought my first inline skates. 38. Signed up for my first inline marathon. 39. Started a new job as a training department manager at a growing SaaS software start-up. 40. Stood in two states at once – Iowa and Nebraska. 42. Took a foam roller class. 43. Traveled to 13 US states. 44. Treated myself to monthly massages. 45. Visited my mom and had mother/daughter/granddaughter holiday lefse making day. 46. 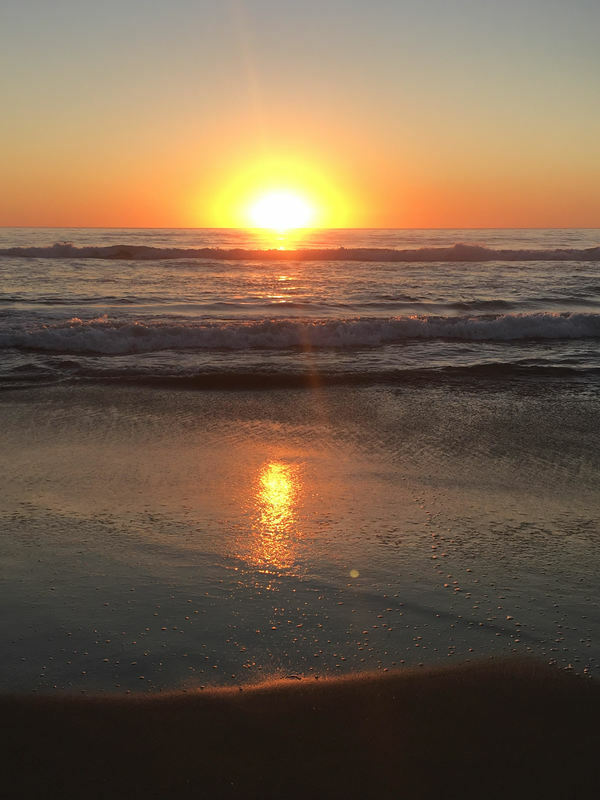 Walked along the beach and watched the sun set over the Pacific Ocean. 47. Watched "Lethal Weapon" at the Parkway Theatre. 48. Went to the gym at least eight times a month from April through December. 49. Won two Step Bets to and increased my overall activity level. 50. Worked my first learning and development contracting gig. Whoa. I did accomplish a few things. I love that I had milestones including health, adventures, and garden-variety adulting. Seeing this list helped me remind myself of the amazing things I can do. Taking a moment to celebrate, and be grateful for, these successes has me excited to plan for next year's adventures! What did you accomplish this year? Leave your thoughts in the comments. It's the time of year when it's cold outside, but warm and generally festive inside. The girl (now 15) and I have mother/daughter movie night on a regular basis. The week before Christmas until the new year is holiday-movie-palooza. Here are my three all time favorite holiday movies, and three honorable mentions for your viewing pleasure. When I look back at the movie that I have seen the most times, hands down, over my lifetime, the winner is Die Hard. I first saw it when my sister videotaped it from HBO long, long ago. It has stood the test of time as my favorite movie ever. The storyline holds together well all these years later. Even the comment in the opening scene (making fists in the carpet with your toes) causes John McClain (Bruce Willis) to end up barefoot throughout the movie. Holly (Bonnie Bedalia) using her maiden name at work prolongs Hans (Alan Rickman) not figuring out her relationship to the rogue cop until near the end. Al Powell(Reginald VelJohnson) and his backstory culminate in him causing a key bad guy's downfall as Sgt Powell overcomes his fears. Everything is tied together. As an extra added bonus, it's genuinely funny. From Ho-Ho-Ho, to Yippee kay yay, people lacking self awareness (Agent Johnson and Agent Johnson, no relation), and a few characters that make you want to punch them in the face, this movie has it all--including at little Run DMC and Argyle (De'voreaux White), the best new limo driver a guy could be so lucky as to have on his side. This is one of the best romantic comedies ever made. Sandra Bullock is Lucy, a delightful, but lonely, woman who works for the Chicago Transit Authority. She has a crush on a man she has never talked to who takes the train each day. Heroism and hilarity ensue as she saves her crush, Peter (Peter Gallagher), and his giant wacky family thinks she's his fiance. Add a coma, an estate furniture business, Peter's brother Jack (Bill Pullman), her landlord's bumbling son Joe Junior (Michael Rispoli) and Lucy trying to come clean and failing, and you have this clever feel-frustrated then feel-good movie. Throw in a little memory loss, the Callahan family's amazing banter, and neighbor Saul (Jack Warden) trying to help, and you have a movie with the romantic comedy payoff you want after this wild misunderstanding fueled ride. This movie is not only a classic, but includes at least two Christmas holiday seasons. It's the story of Harry (Billy Crystal) and Sally (Meg Ryan) through their meetings over the years and the changes in their relationship. This movie poses big questions. Can men and women be just friends? What is the right amount of cuddling time after sleeping together? Will a man ever leave his wife for his mistress? Can a man tell when a woman is "faking it"? This movie's comedic timing is epic. In an early scene, we see Harry having an initial conversation with Sally as he spews diatribes and spits grape seeds out the window. Later, Harry and his best friend Jess (Bruno Kirby) discuss Harry's impending divorce at a football game pausing intermittently to do the wave There's also the amazing scene where Jess and Harry have a phone conversation at the same time as Sally and Marie (Carrie Fischer) and the conversations overlap. All of this is punctuated by interviews of couples explaining their relationships, ending with Harry and Sally telling their story. It's a cinematic wonder. With movies, it's hard to pick just three. For good measure, here are three more that I love. Elf: Will Ferrell as a crazily tall elf named Buddy. Cotton-headed ninny-muggins. Ginormous toilets. Miles Finch. Francisco being fun to say. The inevitable saving of Christmas. You had me at Will Ferrell. White Christmas: Bob (Bing Crosby) and Phil (Danny Kay) as war buddies turned show biz partners. Judy (Vera Ellen) and Betty (Rosemary Clooney) as a musical sister act. Snow. VistaVision. Choreography. A struggling general. Irrelevant musical numbers for no particular reason. A happy ending that makes me cry a little each time for all the reasons. Bridget Jones Diary: Bridget (Renee Zellweger) and her delightful awkwardness as she decides to change her life. Mark (Colin Firth)'s horrid Christmas sweater. Two British men (Colin Firth and Hugh Grant) attempting to have a knock down, drag out fistfight that hurts a little to watch, but in a hilarious way. Genuinely tiny knickers. It's a lovely triumph of a not-quite-perfect woman who gets the guy she wants more than once. Now I have a machine gun. Ho-Ho-Ho. What are your favorite holiday movies? Include them in the comments. I’ve been laid off 4 times, twice in the fall. In fact, last year at this time, I was “in transition” searching for a new opportunity. Being in job transition is rough. Being in job transition during the holidays—especially the week before Christmas through the new year—is downright futile. Happy holidays? Maybe not if you're a job seeker. I’ve read a ton of articles touting the benefits of job searching during the holidays--and I mean a lot, a lot of them. Reasons to keep going abound. No one else will be applying! You’ll get a leg up on other applicants! Tons of people are trying to fill positions before year's end! In spite of the articles I read that encouraged me to persevere, in retrospect, I would have ignored that advice and deferred to my own best judgement. I look at the sheer number of articles on self-care during the holiday season. If the holiday season is hard all by itself, add the stress of unemployment and there are a whole ton of reasons to be extra sure to take care of yourself. ​Here’s the best advice I didn’t take: take time off from your job search during the holidays. Even in a fast-moving job market with ridiculously low unemployment, it takes a bit to find a job. Just given the linearity of time, there will be a gap between when you apply, interview, and get an offer you’d like to take. This process can feel like it takes an eternity when people at these potential employers are focused on working. During December, with people taking time off for all things holiday, finding gainful employment moves even more slowly. Take a break and let yourself move more slowly, and deliberately, too. During my last job transition, which lasted 5 months, the most frustrating period was a couple of weeks after Thanksgiving until the end of the year, the last two weeks of December were the absolute worst. Aside from the darkness and winter weather, the sheer sucking void of job prospects hit me hard. In short, nothing came from my job searching at that time. I was either submitting applications to jobs that no one was going to pay much attention to for a couple of weeks, following up with employers who had other priorities, or bothering former colleagues for recommendations when they were in the throws of Christmas programs and family get-togethers. The job search picked up again the second week in January when people had their heads back in the game at work. Puppies dressed like Santa, not your job application, are the priority in December. My advice to you as a job seeker? Take a holiday break. Go do things you’d like to do when you’re gainfully employed, but that are harder to find time to do. Go to a noon yoga class. Get together with friends for lunch. Read a novel with no obvious professional development benefit. Go to a matinee. Visit a museum. Walk around the mall on a weekday Take some time for you. Take a break from pounding pavement on your job search and just breathe. You’ll feel better for taking some time for you, and for not feeling like you’re working hard and getting few results. Just like we all need vacation time to recuperate from our day jobs and be able to do good work, we also need to take a break from a job search so we can have the mental space to regroup. Take a couple of weeks off—like the week before and the week after Christmas—and reset. You’re future self will thank you for this act of self care. Ramp up to reconvene your job search in the new year. What has your experience been applying for jobs in December? Share your insights in the comments. We all know that we should eat a “healthy” diet. What does that mean? It’s easy to get caught up in the whirl of diets that are popular today—be it Keto, Paleo, DASH, Atkins, Whole 30, or something totally else—and feel like whatever changes you make might be the wrong ones. So now what? I TOTALLY make things like this all the time. Except not. ​Life changes are hard. Everything is new, and everyone has an opinion on what you should or shouldn’t do. We all know that we should move more and eat less, but we often get in our own way when it comes to making a healthier life happen. Here are three mindset tips that helped me stop overthinking and start making better dietary choices. Look! Two windows! In a row! Finding photos for blog entries is hard. Over the years, I’ve dieted a ton—including Weight Watchers, Naturally Slim, TOPS, SlimFast and other ridiculous things I have blocked out. While I had success some (but not all) of the time, the effects were short lived. Changing your diet in the short term, but not looking at how to create sustainable changes, leads us right back where we started and leaves us feeling defeated because we succeeded, then failed. Such is the issue with going on a diet with the goal of losing a set amount of weight in a set amount of time. Instead, it’s better to focus on changing your overall diet, and on a larger scale, your lifestyle. This means the possibility of fewer results right away, but a better chance of real deal, longer term success. Instead of lying to yourself that you’ll never eat [insert thing you absolutely love] again, figure out how to make better overall choices with food that will become just regularly schedule life longer term. Steve Kamb, founder of Nerd Fitness, has advice to help stop the spiraling before it starts. One of the core tenants of Nerd Fitness is “Never miss two in a row.” Basically, if you miss a workout, or eat a not-so-healthy meal, instead of giving up, consider it the blip that it is and keep on going. Instead of eating a donut at work, deciding you are a horrible person who can’t commit to anything, and make abysmal food choices for the rest of the day—and perhaps forever—commit to not missing two in a row. So you had a donut. Make your next meal or snack better. That’s it. Instead of labeling yourself a “failure”, label yourself “human” and get back to your bigger plan of healthier living. No clue about what the background of this image is, but, yay 80%! Tip 2: Get It Right 80% of the Time. For every identified way of eating that could be successful, there is someone who is ready to proclaim that whatever you’re doing is not “right” or in keeping with said established diet. Instead of listening to the voices online, in your family, or simply in your head trying to convince you that you’re not a good enough paleo/vegan/pescatarian, tune out the unhelpful voices out and focus on eating more things that are better for you more often. Other people can pound their tiny fists as much as they want to, but they are not living your lives, and, honestly, they don’t get a say in your choices. Dr Michael Greger, author of “How Not to Die”, is an advocate of the benefits of a Whole Food Plant Based (WFPB) diet, which he backs up with scientific research. However, he also points out that making positive changes can be iterative. 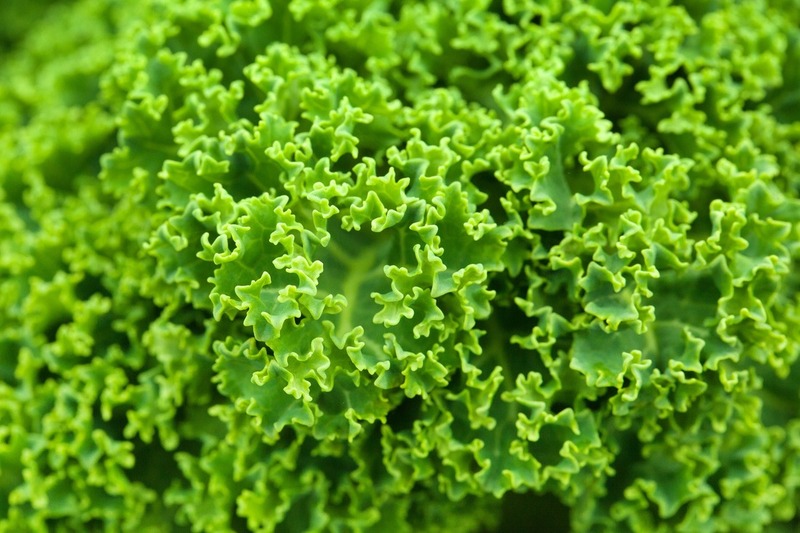 For example, if you’ll eat salad greens (which have multiple health benefits), but you need to have Bacos on it (which are processed and not great for you), make that iterative, positive change! More than once, I’ve had a big salad loaded with vegetables and a side order of french fries. In short, improve your diet, don’t beat yourself up for doing things you want to do. That’s the path to self-loathing and general unhappiness, not an overall healthier you. Over time, as you eat more things that are better for you, your body will start to crave healthier food and not have any time for the Bacos/fast food/whole entire cake that you would have eaten routinely in the past. That 80% gets you where you need to be in spite of a “keeper of the label” making uninvited commentary on your choices. Tip 3: Sometimes, You Have to Eat Like a Dog. When you start to look at making a chance in how you eat, everything in life gets harder. If you’re no longer picking up a burger at the drive though, now what the heck do you eat? How much do you have to figure out how to cook? What do you even buy at the grocery store? Where is the grocery store anyway? Enter my personal trainer, Colin, with the best, most practical advice ever. When I told him that I struggled with meal planning, he simply stated “sometimes, you have to eat like a dog.” He went on to explain that I don’t have to make something elaborate for every meal. Instead, I should pick a few staples and move up from there. He pointed out that we feed our pets the same thing every day for a reason—they need certain health needs met, and we know their food will do that for them. Why not do the same thing for ourselves? Done! I know I’m getting the nutrition I need, and I’m not spending an inordinate amount of my life trying to figure out what to eat. Problem solved. For others, it may be cooking up a whole bunch of chicken, boiling a dozen eggs then creating meals to take to work each day that include protein, frozen vegetables, an orange, and string cheese as a snack. For me, now that I have basic, go-to meals, I am starting to research additional meals I might want to make. The better you are at having at least a basic game plan for what you’re going to eat, the better set up you will be for success. What are your best go-to pieces of practical advice for healthy eating? Share your thoughts in the comments. ​I recently had a friend ask me what I liked more: inline skates or roller skates. 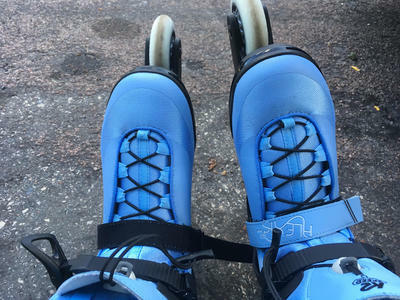 Inline skates (which many refer to as Rollerblades, even though that is one inline skate company) tend to have 3-4 thinner wheels right down the middle of the skate. Conversely, quad skates have 4, wide wheels, and bring images of the “brownie” skates people may remember renting at the roller rink. For me, it’s a more complex question based on the type of skating I’m doing. My daughter, the roller skater and her best good friend, the inline skater. Surface: Indoors or outdoors? Polished concrete or asphalt? Walking trail or paved for bicycles? Consistent surface or paved one minute, then crossing a street the next? Maneuverability: Going straight or bobbing and weaving? Skating along or stopping and starting frequently? Skating forward at a consistent pace or always changing directions? Distance: Am I doing a few laps or skating for miles? Am I sprinting to get somewhere quick or skating a distance that could take hours? Am I skating one mile or a marathon’s worth of miles? I bought my roller derby skates specifically for that purpose. Quad skates are required, and, like most people recommend for derby, they have a shorter boot, fit well, and have harder wheels. Since we’re indoors on a polished concrete floor, the harder wheels make it easier to move fast, switch directions, and stop in a number of different ways. I bought Sure-Grip Rebel Avengers and later swapped out my wheels for Sure-Grip Zombie Wheels. When at a roller rink, my roller derby skates are the hands-down choice. When indoors on a flat, consistent surface, I practice derby related skills, like plow stops, t-stops, crossovers, and transitions. In roller derby, we do a lot of “edge work,” which means using the insides and outsides of your wheels to start, stop, or turn. At the rink, these same skills enable me to dodge unpredictable children and stop at a moment’s notice. Roller derby skates: good for dodging children and evading anyone trying to knock you down. My outside roller skates are basically my starter roller derby skates (Reidell Dart Ombre) with softer, outdoor wheels (Moxi Outdoor Roller Skate Wheels). They enable me to practice derby skills outside while also giving me a little extra cushion for skating on harder, sometimes less well maintained, surfaces. Whether it’s a skate park or a tennis court, these give me the feel of my derby skates with more cushion to make a rougher, yet fairly consistent surface, manageable. I have also used these skates when I am skating at an outside event where starting and stopping happens a lot. At an event like Minneapolis Open Streets, where they encourage people to walk, bike or skate, made my outdoor roller skates the right choice. Since this involved starting and stopping frequently, and then skating a short distance to the next location, these were the winners. I also wore these around my office on Halloween since there were multiple terrain changes, and I wasn't trying to go fast. When it comes to trail skating, I have used my outdoor roller skates in the past. 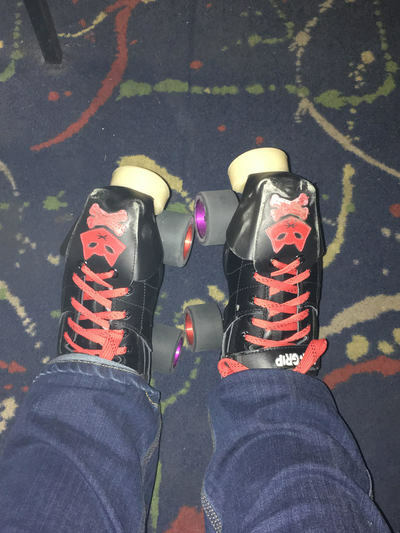 Now that I’ve acquired my inline skates for this purpose, I may occasionally use my outdoor roller skates for cross training purposes, but not for most of my distance skating. Softer wheels are better for navigating more uneven surfaces on roller skates outdoors. 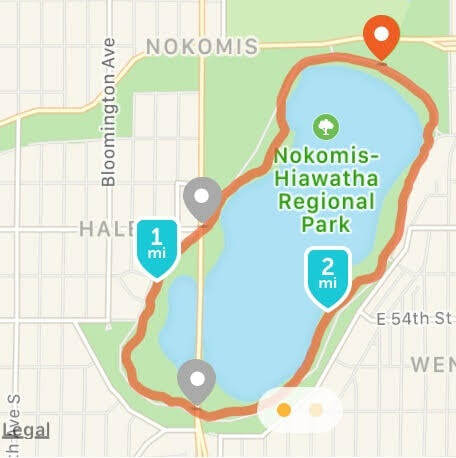 While training to do an inline half marathon, I discovered that skating on my outdoor quad skates for a mile or more was less than ideal. Skating on 3-4 narrower wheels, rather than four, fat softer wheels, enables me to go more quickly with far less resistance from the surface. For skating further, and faster, inline skates are the way to go. Mine are K2 Alexis Pro Inline Skates. Since trail skating and skating longer distances involves going in one direction, going a long way, navigating a few terrain changes, inline skates are a better choice. At this point, I am used to moving on roller skates, so I’m currently not as agile on inline skates. As I continue to train more, and occasionally skate on inline skates at the roller rink, I’m sure my agility will continue to improve. Inline skates are better for longer distances on uneven surfaces. Are you a fan of inline skates, roller skates, or both? Share your insights in the comments.